Bare-TT are Katia Barrett and Mélissa Tun Tun. 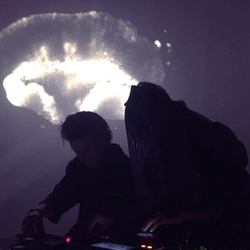 They are a duo that exists at the intersection of computer music and live electronics. Using warped field recordings with altered voices, DJ player loops, and phase distortion synthesis they create soundscapes that oscillate between micro and macro environments. In their performances, Bare-TT narrate the possibility of symbiotic regeneration and metamorphosis. Their practice is informed by spatial music and acousmatic interpretation and inspired by the promiscuity of species, horizontal gene transfer, alien morphologies, and the possibility of becoming vegetal.